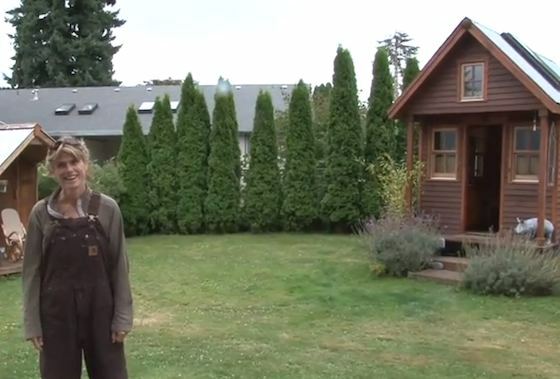 In this video Kirsten of Faircompanies takes you to the tiny home of Dee Williams where she's set up in a friend's backyard in the house she built for $10,000 about 9 years ago. If you don't know Dee by now you should know that she used to live in a 2,000 square feet 3-bedroom home. Then she did some traveling in Guatelama to help build a school for children. When she came home, she felt like her house was way too big. 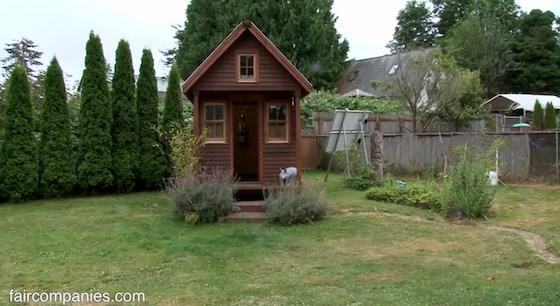 Once she ran into a magazine featuring tiny houses she knew what she had to do next. And that was to build her own 84-square-foot tiny home on wheels. How Does Tiny Living Feel After Doing it for 9 Years? Yes. Nine years later the tiny house still feels just right for her. Even though Dee Williams lives without running water, a refrigerator, washer or dryer, and without her own shower either. But for her it's not just about her house and its amenities. It's about community. So she doesn't mind helping out around the micro-homestead while she gets to use some of those missing amenities in the other structures. Dee built everything herself and she did so in just 3 months. She even built a separate sauna that any member of 'the compound' can use. Since there's no running water she just re-fills what she needs. Her kitchen sink consists of a gravity water fed container and a small custom sink. The grey water simply ends up in a large glass vase/container underneath the kitchen counter. A Home the Size of an Area Rug? Around the 5:20 part of the video below Dee talks about how her home is literally the same size as many area rugs and how amazing it is that if you wanted to you can pare your life down to something so small and simple. 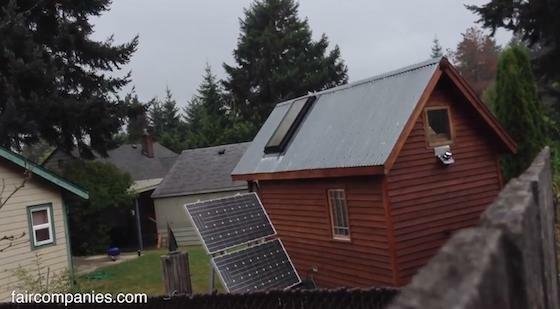 The solar runs the lights and laptop. The propane runs the 1-burner stove and heater that she uses. So it's pretty basic. One of the things that I think makes Dee Williams' house great is that she used lots of reclaimed materials to build it. This is also how she was able to build it for around $10,000. But her kitchen countertop actually comes from an old pocket door. She used old copper scraps to create a spot to hang mugs and towels in the kitchen. The mugs are hung with old forks. The recycled slab of wood above the copper serves as a shelf. The window trim came from a futon bed that her neighbor chucked. Most people would overlook these things. Dee used ideas and materials like that to finish her home beautifully. When moving into a tiny house or any really really small space you kind of have to be picky on what you decide to keep because you have to. So the most interesting and fascinating part about living tiny is how it forces you to find purpose in life. Living in a tiny space commits you to finding out you don't need and what you can't live without. I like how Dee addresses this when she asks, "What things would you want to hold in your arms when you die?" And for most of us it's NOT a thing. And if it is it would probably be a blanket your mom made you, something a loved one gave you, or a photo of a memory or experience. But it wouldn't be a watch, the latest gadget or anything like that. For me it's about people. And I think that's Dee's message here. When I die, I want people around who love me. I want to share my last moments with them. And I think that says a lot about what's really important in life right now. Learn more about Dee Williams over at her company PAD Tiny Houses where you can get her book on how to build tiny, use her tiny house plan offerings to build, and attend her workshops to learn. Read the original article over at Faircompanies right here. If you enjoyed this video/interview with Dee Williams you'll love our free daily tiny house newsletter!